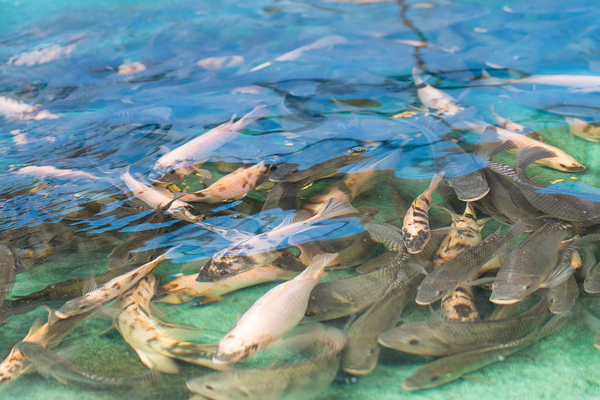 Pictured: Tilapia growing in an aquaponics system at the Waimānalo Learning Center, one of several Ola grant-funded community pilot projects. Deborah Manog photos. Could backyard aquaponics promote healthy eating among Native Hawaiian families in Waimanālo? University of Hawaiʻi researchers will attempt to answer that question and more with a $23 million federal grant awarded in 2017 for the Ola HAWAIʻI Specialized Research Center. The center supports a team of investigators and community collaborators researching the causes of and possible solutions to health disparities among underserved, multiethnic populations in Hawaiʻi. The funding, through 2022, will support research and community-based activities focused on advancing health for citizens who suffer disproportionately from genetic, environmental and socio-economic related disparities in health and healthcare access. The goal of the center is contained in its name: “Ola HAWAIʻI.” Ola, which means health or to heal in the Native Hawaiian language, and HAWAIʻI, in this case an acronym standing for “Health And Wellness Achieved by Impacting Inequalities”. Other UHM partners include The UH Cancer Center (UHCC), The College of Natural Sciences (CNS) and The Pacific Biosciences Research Center (PBRC). “This is a broad-based academic endeavor and one that is strong because of the way it brings people together for common purpose even with differences in training and professional identity,” said Jerris Hedges, MD, Dean of JABSOM. UH Mānoa and its partners earned this significant, multi-million dollar national investment by their strong records of commitment to educating and serving underrepresented populations facing health disparities. Dr. Hedges and MBTSSW Dean Dr. Noreen Mokuau lead the grant, funded by the National Institute on Minority Health and Health Disparities (NIMHD), part of the National Institutes of Health. The Ola HAWAIʻI Specialized Research Center will support multidisciplinary teams of investigators and community collaborators as they conduct basic biomedical, behavioral and clinical research on the causes of health disparities and the most effective solutions to reduce those disparities among the underserved, multiethnic populations in Hawaiʻi. UH Mānoa is one of only seven universities where these Specialized Research Centers are being funded. The others are located in Florida, Alabama, North Carolina, Tennessee, Arizona and Puerto Rico. 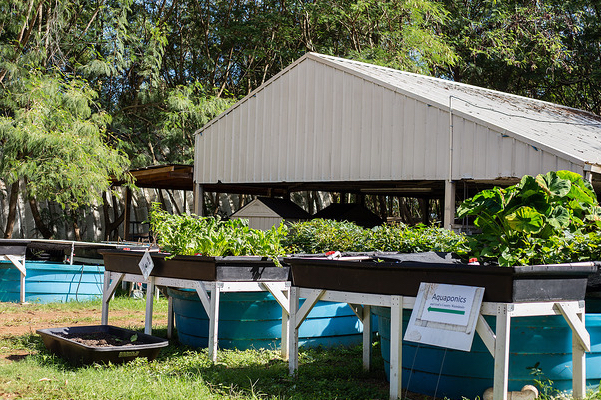 An aquaponics pilot project to promote healthy diets at the Waimānalo Learning Center. Deborah Manog photo. Backyard Aquaponics: Promoting Healthy Eating among Native Hawaiian Families” will focus on testing a 3-month culturally grounded family-based backyard aquaponics intervention with Native Hawaiian families living in Waimānalo. The study innovatively merges the modern technology of aquaponics with traditional Native Hawaiian practices to create a “mini ahupuaʻa” system in families’ backyards to provide constant access to fresh fruits, vegetables, and fish. Through six hands-on community workshops, family members from keiki to kupuna will collectively learn how to build and maintain their aquaponics systems and to create nutritious meals and lāʻau (medicine) with their produce. Dr. Ted Radovich and Ilima Ho-Lastimosa from UHM College of Tropical Agriculture and Human Resources (CTAHR) are working with the UHM Office of Public Health Studies to examine the cultural relevance of this intervention and identify changes in eating habits and obesity risks, cultural identity, family cohesion, and community connectedness. Lishomwa C. Ndhlovu, MD, PhD, a tenured JABSOM Associate Professor HIV immunologist (originally from Zambia), will serve as the contact Principal Investigator in a Multiple-Principal Investigator project on the role of macrophages in atherosclerosis in HIV-infected individuals, with JABSOM’s Dominic C. Chow, MD, PhD, an AIDS clinician scientist, and William A. Boisvert, PhD, a basic cardiovascular scientist, Department of Medicine. Alika K. Maunakea, PhD, a Native Hawaiian tenure-track JABSOM Assistant Professor (Department of Native Hawaiian Health), will apply his considerable expertise in epigenetics to uncover immuno-epigenetic signatures which are predictive of diabetes mellitus outcomes by integrating detailed individual-level health behavior, clinical/immunologic, genetic, and monocyte- specific epigenomic data with neighborhood-level social environment data from the NCI-funded Multiethnic Cohort Study of Diet and Cancer. Lucia Seale, PhD, a Latina junior investigator at JABSOM, Department of Cell and Molecular Biology, will test the hypothesis that selenocysteine lyase regulates glucose homeostasis through regulation of glycine metabolism and pyruvate levels via interaction with pyruvate carboxylase to fuel energy metabolism. This research will provide insights into obesity and diabetes. Deborah Goebert, PhD, a community investigator, along with co-investigator Diane Eckert, MD, both from the JABSOM Department of Psychiatry, will use a community-engaged approach and cultural knowledge and practices to develop and demonstrate a culturally responsive, multi-faceted youth suicide prevention program that has a positive impact in a Native Hawaiian community. Yan Yan Wu, PhD, of the MBTSSW Office of Public Health Studies, is expert in developing complex statistical tools to model the effects of genes and environmental factors associated with complex human diseases. NIH, the nation’s major medical research agency, includes 27 Institutes and Centers and is a component of the U.S. Department of Health and Human Services. NIH is the primary federal agency conducting and supporting basic, clinical, and translational medical research, and is investigating the causes, treatments, and cures for both common and rare diseases. For more information about NIH and its programs, visit www.nih.gov. Funded by the National Institute on Minority Health and Health Disparities, National Institutes of Health, Ola HAWAIʻI has been awarded for 5 years (September 2017 – June 2022), grant #2U54MD007601-31 for a total amount of $23,105,067.